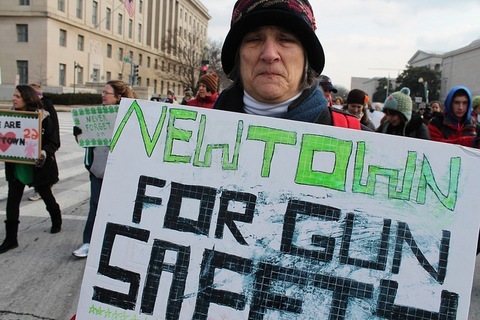 A protester marches down Constitution Avenue during the Jan. 26 March on Washington for Gun Control. Photo by Flickr user Elvert Barnes. When voters in Illinois’s 2nd congressional district head to the polls next week, they’ll be choosing between candidates whose A-plus and F ratings from the NRA have thrust the gun debate into central focus. The 16-person race in Chicago, a city plagued by gun violence, is primarily a contest between between former Rep. Debbie Halvorson, a Democrat whose seat used to be considered more of a suburban swing district, and former state Rep. Robin Kelly, also a Democrat. New York City Mayor Michael Bloomberg is spending as much as $2 million to help Kelly. The urban-rural split dividing Halvorson and Kelly on gun control highlights the extent to which the current gun debate — and the political frames used on each side — transcends pure partisanship. The lasting impact the shooting massacre in Newtown, Conn., has had on the political debate over guns has brought heightened attention to the language both sides are using. The traditional “gun control” side has zeroed in on the negative effects of guns, namely violence. Meanwhile, as Republican operative Ron Bonjean points out, the traditional “gun rights” side is talking less about guns and more about how they are misused, shifting the focus to mental health and tougher enforcement of current laws. While the shift in language on the left has garnered greater attention since the Dec. 14 shooting, it’s an evolution 20 years in the making. The Atlantic’s Molly Ball traces the concerted efforts behind this shift in messaging in her article titled, “How the Gun-Control Movement Got Smart.” Perhaps most illustrative, she recounts how the National Council to Control Handguns rebranded itself as the Brady Campaign and the Brady Center to Prevent Gun Violence. As Ball notes, Democrats were growing weary of a gun control message that they felt contributed to their loss of congressional control in 1994 and of the presidency in 2000. Democrats were losing voters they should have been winning over, all because of the gun issue. George Lakoff, cognitive linguist at the University of California, Berkeley and co-author of “The Little Blue Book: The Essential Guide to Thinking and Talking Democratic,” has been working since 1996 to help the left reframe its position in a debate he sees dominated by conservative framing gone mainstream. As Lakoff explained, there are two competing moral systems — one favoring individual responsibility and liberty, and another more collective, progressive vision — each of which is controlled by a different neural network. But many people are hybrids; they’re both liberal and conservative, depending on the issue. The task for liberals, Lakoff explained, has been to find a language that appeals to that overlap — the liberal hunter, if you will. The language of gun “control” automatically alienates the individual liberty moral system. Gun “safety,” however, appeals to the same person’s sense of personal responsibility. Lakoff sees the control frame beginning to recede in favor of the safety frame. In announcing his 23 executive actions on the issue, for example, President Obama did not use the word “control” in his remarks. And in his most impassioned call to action on the gun issue, at the conclusion of his State of the Union address last week, he targeted violence, not guns. Given that people — not guns — enjoy rights, a rights-based frame is a kind of code, notes Richard Feldman, president of Independent Firearms Association Inc. and author of “Ricochet: Confessions of a Gun Lobbyist,” which calls attention to the human agency needed for guns to be dangerous. But the NRA has not had to communicate with the public at large; they communicate with their members. Gun control advocacy groups, by contrast, are more invested in swaying public opinion, explains Democratic strategist Mo Elleithee. Bonjean argues that the NRA is doing a good job of showing that more laws on the books will only curb the rights of Americans. Other gun rights organizations, such as the Second Amendment Foundation and Virginia’s Citizens Defense League, employ a similar frame that taps into American rights culture and the power of the people to topple tyrannical governments. Gun rights defenders’ fears of having guns taken away — intensified since Newtown — means NRA members will turn out at the polls in force in 2014, predicts Harry Wilson, director of the Institute for Policy and Opinion Research at Roanoke College and the author of “Guns, Gun Control, and Elections.” Supporters of gun control, by contrast, usually struggle to capitalize on the much more ephemeral motivation to take action following shooting tragedies. The language that drives the gun debate is peppered with other terms that carry loaded meanings. Gun show “loopholes,” for example, are a frequent target of the gun control movement. “Loophole” evokes tax avoidance and other shady behavior. But to the gun rights side, these loopholes are simply private sales. The term that seems to anger gun rights folks the most is “assault weapons.” Gun rights defenders fume over the prioritization of aesthetics over functionality when government attempts to apply that label. As Feldman sees it, any weapon — even the most rudimentary musket — is capable of assault in the hands of a dangerous person. Gun control advocates, however, counter that assault weapons are not something that any law abiding shooter or hunter would need. That word “need” is key, Wilson says. “The onus is on gun owners to demonstrate that they need this. But for gun rights people, need is irrelevant because ‘it’s my right. '” This discursive fight is typical of how both sides of the gun debate talk over one another, speaking two different languages. If there’s one phrase shared by the vocabularies of both sides, it’s “common sense.” Mr. Obama called for “common sense reform” during last week’s State of the Union address. And the NRA touted LaPierre’s call for armed guards in schools as a “common sense solution,” the exact same phrase used by Americans for Responsible Solutions.